Reviewed! 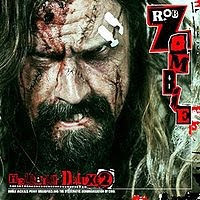 Rob Zombie - "Hellbilly Deluxe 2: Noble Jackals, Penny Dreadfuls, and the Systematic Dehumanization of Cool"
"Hellbilly Deluxe 2: Noble Jackals, Penny Dreadfuls, and the Systematic Dehumanization of Cool"
Those looking to “Hellbilly Deluxe 2: Noble Jackals, Penny Dreadfuls, and the Systematic Dehumanization of Cool” as chance for Rob Zombie to broaden his musical scope should not be listening to Zombie in the first place. He doesn’t need to do anything of the sort. He is so talented, so brilliant, at what he does that he doesn’t need to change, or have to for that matter. Now, “Hellbilly Deluxe 2: Noble Jackals, Penny Dreadfuls, and the Systematic Dehumanization of Cool,” is in no way a narrow minded record, yet it is exactly the album that Zombie should have released, or better yet, needed to release. It actually would have made more sense for this album to have been released when “Educated Horses” was, but as they say, hindsight is 20/20. The albums even keeled blend of the creepy, crunchy, aggressive feel of Hellbilly Deluxe and the retro, ultra cool ambiance the Sinister Urge is the perfect recipe for Zombie to climb back on his soapbox and proclaim to the world that he is still one of the best at his craft. Well, he doesn’t need to prove anything to anyone – this is Rob Zombie we’re talking about here. The songs here are short; Zombie isn’t known for penning wandering epics or anything close. These tracks are compact and hit hard – they are concise and immediately to the point. Songs like ‘What!’, ‘Sick Bubblegum’ and ‘Burn’ lead the aural charge on “Hellbilly Deluxe 2: Noble Jackals, Penny Dreadfuls, and the Systematic Dehumanization of Cool,” a charge that very rarely lets up throughout the albums 46 plus minutes, although there are scattered pitfalls along the way. Prattling, seemingly endless songs like ‘Mars Needs Women’ and ‘the Man Who Laughs’ prove that by no means is this a perfect record. If you think about it, “Hellbilly Deluxe 2: Noble Jackals, Penny Dreadfuls, and the Systematic Dehumanization of Cool” needed to be a success. Could Zombie really have come out and named this disc the predecessor to his finest work in “Hellbilly Deluxe” and gotten away with it if it failed to meet expectations? In short, no.